Do you have what it takes to become an ASSIST@HOME Quality Care caregiver? If so we want to hear from you, please Fill out this form! 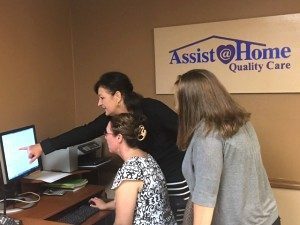 Assist@Home Quality Care continues to grow our team by finding the best Certified Nursing Assistants (CNA), Certified Home Health Aides (HHA) and companion homemakers. Do you want a job where you can make a difference in someone’s life, where your experience and skills are valued? Are you trustworthy, reliable and responsible? Do you have a kind heart and a desire to help others? If so, then Assist@Home Quality Care is a great home for you! We have immediate openings for experienced Caregivers/CNAs. We treat our Caregivers with dignity and respect. Some of our caregivers have been with us since we started operations back in 2006. We offer competitive wages, overtime pay, vacation and sick pay. “I want to thank you for all of your flexibility and dedication to showing your employees how valued they are.” Lisa H., ASSIST@HOME Quality Care employee. “Thank you for the opportunity of working for you, this experience has helped me realize what I want to do with my life.” Madeline L., ASSIST@HOME Quality Care employee.